One of my goals ever since she hit 70 has been to get epic flight for Seph. I scrimped and saved but it took me a while to get the gold together and by the time I had Northrend was upon us and Jez was my first character out the door to level up and get ready to raid. That achieved I started playing Seph a lot more and decided there was no point worrying about epic flying until I could train the cold weather flying skill at level 77. That day recently arrived and with much glee I also purchased the Artisan riding skill. Huzzah! Now I was faced with a choice. I could simply train the epic flight skill or, I could undertake the original quest line. As someone who really enjoys the druidic lore it was a simple choice - I would do the quests and using the wonderful guide by Aurik at /hug it was an enjoyable and straight forward process. Although everything was a lot easier at level 77 I still had a bit of trouble on the Eagle Essence since I elected to stay in Moonkin form and burn the guy down. The other parts of the quest were cake and I just enjoyed the lore even though the running around all over Outlands and then to Azshara was a little tiresome. It just made me look forward to getting epic flight form even more! Emelin on his druid Broichan and Miss Csilla helped me out with a heroic Setthek Halls and finally it was mine (sadly the mount didn't drop)! Seph is now a very pretty, very fast, birdie! 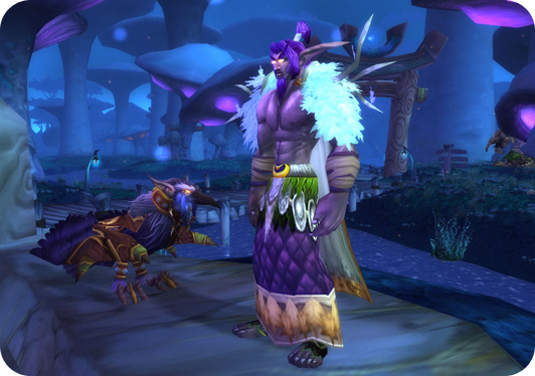 Woot - gogo Druid flight form. Such a hack that its instant cast! Wishing you all the best in life!